Users licensed for the data service can access power generation data for Argentina, Brazil and Chile along with our Argentinian and Mexican gas balances and Brazilian gas supply data. We expect Latin American LNG takes to shrink by 2.5 Mt y/y to 14 Mt in 2019 as both domestic production and pipeline imports grow. In December 2018, port receipts dropped 0.3 Mt y/y to 0.7 Mt, with all countries bar Puerto Rico showing y/y declines or flat growth. In terms of gas production, we expect Brazil to log y/y growth of 12% in 2019, while Argentina’s Vaca Muerta output will continue to curtail Latin American LNG imports this year—even allowing the country to become an LNG exporter from Q2 19, once its 0.5 Mtpa Tango FLNG comes online. We also see LNG demand in both Mexico and Chile slowing this year on expectations of greater pipeline imports, though the risk that Mexican pipeline infrastructure will be further delayed provides potential upside to our LNG numbers. 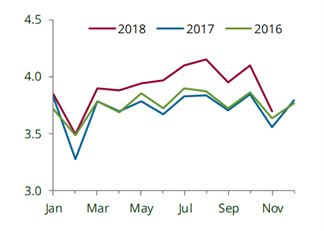 The key driver of our bearish LatAm LNG import view for 2019 is ramping production at Argentina’s prolific Vaca Muerta play. In 2018, Vaca Muerta shale growth began to outpace conventional declines, with total Argentine gas output up by a record 2.2 bcm y/y to 43 bcm over January–November 2018 (latest IAPG data), with growth of 2.0 bcm y/y in the Neuquén basin (dominated by the Vaca Muerta). Vaca Muerta growth in 2019 should continue as Shell recently announced plans to develop three blocks—Coiron Amargo Sur Oeste (CASO), Cruz de Lorena and Sierras Balances—while Chevron and YPF have announced plans to invest a combined $800 million to drill 20 wells in the play this year. Also, TecPetrol’s drilling programme at Fortin de Piedra, targeting 15 mcm/d of output this year, should keep adding volumes. YPF’s 0.5 Mtpa Tango FLNG is expected to start exporting cargoes in Q2 19, though we expect initial flows to be small. Argentina's gas demand outstrips supply during winter, so the country continues to plug the gap with LNG imports, though that need is falling as Vaca Muerta production grows. As such, we expect Argentinian LNG imports to be 0.9 Mt lower y/y at 1.8 Mt over Q2 19–Q3 19. Raising shale output is also encouraging Argentine exports to Chile, with the first significant flows for 12 years taking place in November 2018. Argentina plans to export an average of 10 mcm/d to Chile in 2019, rising to 30 mcm/d by 2020. 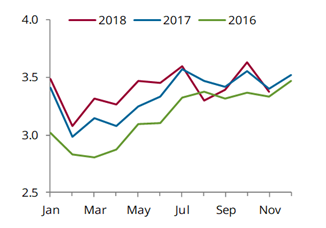 The latest JODI data pegged Chilean pipeline imports at a small 9 mcm in November 2018—the highest since December 2011—indicating flows were starting to ramp up. 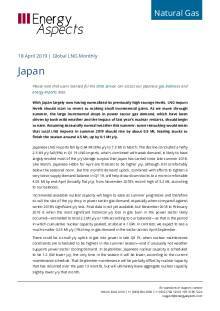 The return of pipeline gas and weaker power sector gas demand on higher renewable generation has led us to revise our forecast of Chilean LNG takes over Q1 19–Q3 19 to shrink by 0.8 Mt y/y. Over January–November 2018, Chilean gas-fired generation fell by 0.7 TWh (6%) y/y as renewables gained in the generation mix, led by hydro (+1.8 TWh y/y) and solar (+1.1 TWh y/y). Brazilian gas output is also to rebound in 2019, following last year’s weak growth. The latest ANP data indicate year-to-November 2018 gas production grew by just 0.7 bcm y/y, compared to an average y/y growth rate of 2.6 bcm in the 2013–2017 period. For 2019, a more robust drilling programme for oil suggests a gain in associated gas production of around 12% y/y. While we expect Q1 19 LNG imports to remain flat y/y at just 0.1 Mt (roughly two cargoes), we expect Q2 19–Q3 19 imports to step down by 0.2 Mt y/y to 1.4 Mt as pre-salt activity starts to ramp up. Despite Mexico’s CFE claiming in early 2018 that it could stop tendering LNG by year-end—plans that were far too ambitious in our view—LNG continued to arrive, albeit at a slower pace. Over Q4 18, Mexico’s LNG imports fell by 0.4 Mt y/y to 1.0 Mt. LNG takes at Altamira, which CFE plans to substitute with piped gas from the 2.6 bcf/d Sur de Texas-Tuxpan (SdT-T) pipeline once it comes online, declined by an average of 0.1 Mt y/y a month in Q4 18, despite reports of acute gas shortages in southeast Mexico. That drop could have come either due to expectations that the SdT-T pipeline connection would already be online, or due to the very high LNG prices prevailing for Q4 18 cargoes during Q3 18. Regardless, LNG imports will have to continue until downstream connections to SdT-T are complete, which could then lead to a further dialling down of Altamira imports. LNG receipts at Mexico’s other terminal, Manzanillo, have remained largely flat y/y since Q4 18 and takes of 0.1 Mt so far in January are also flat y/y. CFE’s first LNG tender for 2019 was for five cargoes for February–April delivery, equating to 0.3 Mt of LNG, all for delivery at Manzanillo. Even for Manzanillo, LNG imports will be replaced by pipeline supply once the Wahalajara pipeline system becomes operational and the reversal of flows on TransCanada’s 0.5 bcf/d Manzanillo-Guadalajara pipeline occurs. While the Wahalajara system is scheduled to be operational in May, the risk of further delays remains high. We expect Mexican LNG takes to shrink by 0.1 Mt y/y in Q1 19 and to drop by a further 1.0 Mt over Q2 19–Q3 19.